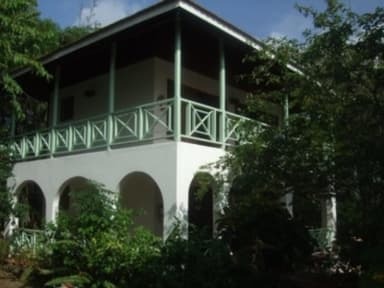 Catcha Falling Star Gardens is a small hotel within a lovely garden setting located on the famous West End road of Nergril Jamaica.The intimacy of our facilities provides a cosy family feeling that is equally welcoming to singles, couples and families. Recently refurbished to a high standard the complex offers ten large, bright and airy junior suites with private balconies. All lower level villas have private balconies and gardens.Amenites include cable television, air-conditioned and fan-cooled bedrooms, hot and cold showers and refrigerators and cable tv. There is a popular restaurant across the road, which provides seaside dining and entrance to and from the ocean, and is the place where you can savour delicious dining and exotic thirst quenching tropical refreshments. Enjoy a free and easy atmosphere and sample your favorite cocktail. We are also walking distance from the world famous Ricks Cafe and about 10 minutes drive from the seven mile beach in Negril Jamaica. We now have a fabulous new swimming pool with waterfall feature. 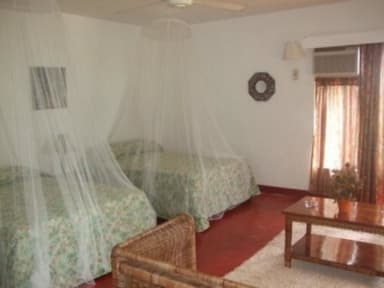 Air conditioned rooms available on request for an additional fee. Subject to availability.